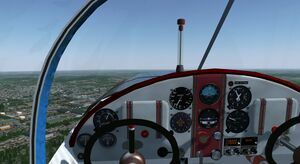 You can read the latest newsletter at FlightGear Newsletter March 2017. One of the more prominent ones is the new Citation config dialog. It allows for settings, such as, what group of items you want to be stored throughout sessions. Also, for convenience, it provides some shortcuts to most used dialogs and a button to reset all circuit-breakers at once. Check it out in sim via menu -> Citation II -> Citation II config. Also 2 tutorials have been added in the 707 style - with markers, view zoom and explicit messages. See the Citation II config dialog or menu -> help -> tutorials. It is now possible to start the Citation II in some assorted states. You could start FG on a parking space and add --state=parking to startup the Citation cold and dark. This would be a good place to start the startup tutorial from the config dialog. Or you could start on the runway and add --state=take-off to your launcher. All you need to do is throttle up and go! Or take the tutorial "take-off" from the config dialog, which will guide you savely to cruise altitude, according to official checklists. James has added a new splash screen scheme, as well as a new preview feature for the QT launcher. The Citation II now complies with that scheme and provides a new logo and some brand-new splash screens. If you want to participate in the screenshot contest of May 2017, you can submit your candidate to this forum topic. Be sure to see the first post for participation rules. For purposes of convenience and organization, after all the entries have been submitted, a new forum topic will be started containing all shots in an easy-to-view layout. The voting will then take place there. Once the voting has finished, the best screenshot will be presented in the Newsletter edition of May 2017. This page was last modified on 16 July 2017, at 11:43.